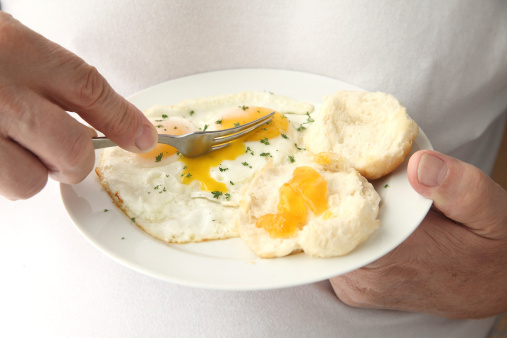 Eggs often get bad press in the medical community. The main cause for concern is the high cholesterol count of eggs. It is true that cholesterol negatively impacts the heart — sometimes to the point where you’re at greater risk for developing heart disease. But this needs some serious clarification. First off, yes, the yolk in every egg is very high in cholesterol when you take its size into consideration. But there is a distinction to be made here: dietary cholesterol (found in your food) is far different than blood cholesterol, which is the amount flowing through your body. These two are not as directly related as scientists used to think they were. The cholesterol inside the yolk does not immediately become blood cholesterol, which is the real problem that leads to heart conditions. Our liver actually makes blood cholesterol, which comes in two kinds: HDL (good) and LDL (bad). Many studies show that it is actually saturated fat — not dietary cholesterol — that raises our LDL cholesterol levels. Eggs are actually not high in saturated fat, which would explain why people who eat a couple of eggs a day don’t seem to have increased cholesterol levels. Now a research team at the Harvard Medical School has found that an egg a day for breakfast probably won’t increase your likelihood of developing type 2 diabetes either. In the study, researchers failed to see a significant association between eating eggs occasionally or almost daily and the development of type 2 diabetes. They analyzed data from almost 4,000 older men and women to come to this conclusion. Eggs can actually be very beneficial to your health and that benefit is the result, the researchers say, of all of the nutrients of an egg being taken into account. Eggs are high in protein — in fact, you’ll get 11% of your daily value of protein by eating one egg, which has 5.5 grams of protein. Eggs are also high in vitamin K, selenium, choline, iodine, and vitamin B2. For the study, the research team found that, out of the initial cohort of 3,894 people, 313 developed type 2 diabetes. The researchers could find no link between dietary cholesterol overall and diabetes risk. While men in the top category of egg consumption (meaning they ate eggs almost daily) were at increased type 2 diabetes risk, this increase wasn’t statistically significant, meaning it could have been due to chance.